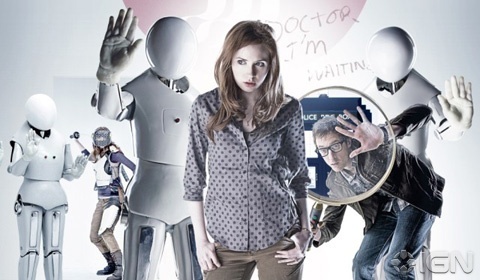 What did you think about “The Girl Who Waited”? I thought it was visually compelling and quite moving. The final scene between Rory and Amy was heart-wrenching. Here’s a recap in case you missed it and please answer the poll. “The Doctor takes Rory and Amy to the planet Apalapucia, supposedly a top holiday destination, but they arrive in a clinically white room, its only exit a door with two buttons that open it. As Amy steps back into the TARDIS to collect her phone, the Doctor and Rory pass through the door using one of the buttons; Amy follows later but by using the other button. Both groups find a similar white waiting room with a glass scope in the center of it, but no sign of the others. When the Doctor realizes that Amy hasn’t joined them, he discovers that she has ended up in a second, faster time stream, but is able to communicate to her through the glass scope, finding a week has already passed for her. The Doctor and Rory soon find a faceless, white robot in the room, who explains they are in the Two Streams “kindness facility”, which is assisting in dealing with a plague known as Chen 7 that affects only races with two hearts, including the native Apalapucians and Time Lords. The robot, and others likes it, do not recognize the two as alien life forms, and attempts to administer injections that would be fatal to them. The Doctor warns Amy of this, and tells her to wait, as he will rescue her. He and Rory race back to the TARDIS with the glass scope, using it to lock onto Amy’s time stream to effect her rescue. The Doctor, forced to stay in the TARDIS, due to the Chen 7 virus, provides Rory with his sonic screwdriver, the glass scope, and a set of glasses that allows the Doctor to see, hear, and communicate with Rory, guiding him to find Amy. Rory explores more of the facility, but soon is set on by more of the robots, when he is saved by a much older Amy, now a vigilante hiding from the complex’s sensors. The Doctor realises that he locked onto the wrong time stream of Amy, and tries to get Rory to convince the older Amy to help locate the younger one. Rory finds the older Amy has become bitter, having waited as the Doctor instructed, and otherwise has been alone for 36 years save for the complex’s computer interface, called “Interface”, and a disarmed robot she has come to call Rory. The older Amy refuses to help, knowing that by saving the younger version of herself, she would cease to exist. The Doctor detects signals from the younger Amy nearby, and Rory finds her through the glass scope, crying to herself. Rory sets the scope to allow the older Amy to speak to her younger self, but the older Amy reiterates that she experienced this before, and hearing her future self warn about the time streams convinced her to wait out for rescue. However, Rory manages to convince the younger Amy to change her mind, and realising that time can be altered (if you are aware of the future timeline, which Amy is), the older Amy decides to help, but demands that the Doctor take her too, a difficult but not impossible task for the TARDIS. The Doctor agrees, and as Rory reroutes a control panel that maintains the facility’s time streams, the Doctor helps the two Amys to synchronize their thoughts, letting the two exist at the same time. Video – The WKRP in Cincinnati Classic Thanksgiving Turkey Drop Clip! – Happy Thanksgiving All!